Products and gear of Island Paintball Supplies, huge Long Island New York paintball store. 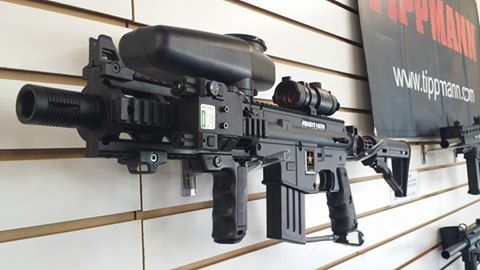 For paintball guns, paintball supplies, goggles, packs, hoppers, barrels, chip boards, and all things paintball, IPS ISYOUR SOURCE FOR GEAR! 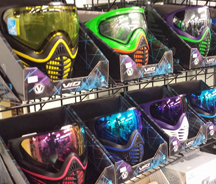 We have a BIG store loaded with tons of paintball stuff. We're not here to list every product we carry. For specific items and pics, please check out our facebook page and link to our online store. NEW AND USED. We buy and sell used items that are in good condition. Used paintguns are generally limited to what we stock parts for, so that we can service them when needed. Used items come and go so fast at Island, by the time we were posting them on the web they were gone. If you are looking for used goods, ask us what's currently in. GUARANTEE. IPS backs up what we sell: lifetime free repair labor on paintguns and air systems is just one of the perks of the ISLAND EDGE service card. Plus, you get free installation and testing of accessories bought from us. HUGE STOCK. IPS is loaded with the best and latest in the sport. 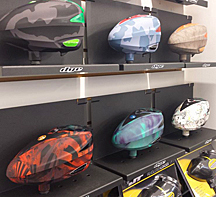 There is no substitute- come in and see our amazing selection! 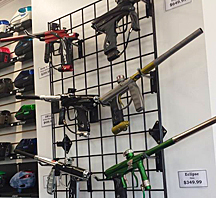 We carry a full line of accessories and upgrades for all the paintguns, air systems, and other gear we stock. From after market bolts and trigger systems, to air chambers and stocks. Island Paintball will MATCH any competitor's price. We DARE you to find something cheaper but if you do, bring in proof of the advertised price and we will match it! Island Paintball is your source for paintball and airsoft guns and supplies. We have been building the sport of paintball since the late 1980s. STORE HOURS: Monday - Wednesday night hours: 4:30 - 8:pm. Thursday-Friday 2-7pm. Saturday 12pm-7pm. Sunday 12pm-5pm. At IPS, All products purchased with a marker will be discounted. Most items will be 10% off, nitro tank discounts vary. All markers will be sold at full price with any package. All markers and accessories will have sales tax applied. Sorry, no "pay cash save the tax" sales. All marker packages include the ISLAND EDGE SERVICE CARD, covering free repair labor for as long as you own it and 60 days free repair parts from IPS, in addition to manufactures warantees. Accessories and modifications bought with markers are not only discounted, they are installed and tested by us for FREE.